The other night my parents and I met at a restaurant in Taunton, MA called Benjamin’s for a biweekly Tuesdays with Sinatra night of music and dinner! 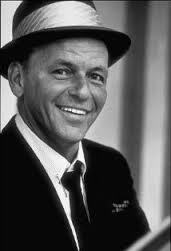 My father LOVES Frank Sinatra and he is turning 60 this weekend!!! The concert lasted 3 hours and was absolutely amazing! The gentleman singing was Mike Dutra and he was Frank Sinatra! I was intrigued at how much he sounded like Sinatra and how his aura was so similar as well. A lot of couples, young and old, got up to dance during the concert. It was nice to see that some people still actually know how to dance and enjoy doing it too! After dinner, while my dad was in the bathroom, I told the waitress he was turning 60 and asked if she could bring over a small cake or piece of one with a candle. I also tried to find out if Frank could sing happy birthday to my dad. She confirmed that she could bring over the cake, but since Frank had already taken his break she wasn’t sure if she could get to ask him. Fair enough right? AHH but not more than 10 minutes later, Frank took another break! My mom and I still weren’t sure whether the waitress would be able to talk to him. But then 5 minutes into his break Frank got back on the stage. As the cake was being brought to the table, Frank turned off the recorded music, walked to the front of the table and sang Happy Birthday to my dad a capella. It was awesome. My dad was so happy, my mom was bawling, and I won’t deny it – I teared up a bit as well. It was such a nice family moment. It also reminds me how much small things can bring about so much happiness!